These bags can be manufactured into a multitude of configurations for an extremely diverse range of applications; however, vinyl bags are most commonly used for commercial and consumer applications. Vinyl Bags – Multi-Pak USA, Inc. When people hear the terms vinyl, PVC or EVA, they most likely think of the hard plastic vinyl records or PVC pipes, but vinyl materials can also come in flexible varieties which serve as excellent materials for manufacturing bags. Flexible vinyl provides substantial toughness, stress resistance, waterproofing, UV radiation resistance, and flame retardant properties. Toughness and stress resistance allow vinyl bags to withstand the wear and tear of daily use, so these bags are especially useful for applications requiring repeated use. Additionally, the inherent resistance to environmental factors makes vinyl bags great for protecting sensitive products and goods. They can be used to protect clothing, electronics, documents, and other objects from water damage and degradation from exposure to UV radiation. Vinyl bags can be further enhanced and specialized with additional features. Bags can be customized with a variety of sealing and closure options, including draw strings, zippers, slide seals, and snap closures. Handles and hangers can also be added to more easily display and transport the items within the bags. Vinyl bags are most commonly manufactured from uncolored transparent vinyl materials, but they can be customized with a broad range of colors and transparencies to more effectively meet the needs of particular applications. 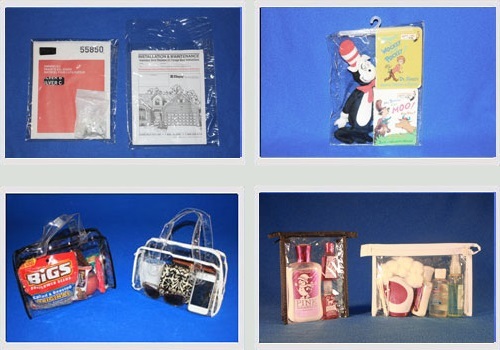 Vinyl bags are utilized primarily in commercial and consumer applications for displaying, transporting, and storing many different kinds of objects and goods. Product packaging is one of the most popular uses for vinyl bags. 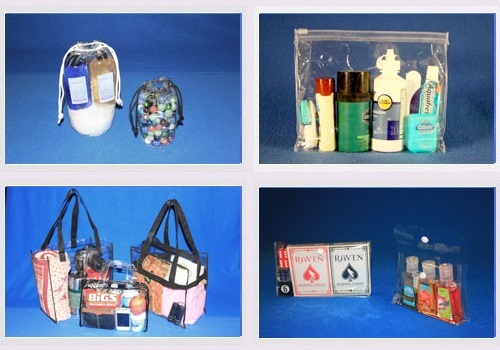 Products sold in sets or in a collection, such as books, toys, and personal care products, can be packaged in vinyl bags to keep the products together and to protect them from damage. Since these bags are transparent, consumers can easily see the products inside, and vinyl materials are very affordable, making this a very cost effective method of selling consumer products. In addition to commercial applications, vinyl bags are also commonly used in consumer storage applications. Bedding, blankets, clothing, and other household items can be packed into vinyl bags to prevent damage during prolonged storage. Items stored in this way are protected from water damage and UV radiation, and vinyl bags also help to keep dust and pests out of important belongings. Zipper bags and tote bags are used most commonly, but many plastic bag manufacturers also provide vinyl pouches, envelopes, shopping bags, and drawstring bags to protect, store, and transport practically any item. Vinyl Bags Vinyl bags are plastic bags constructed from vinyl materials like polyvinyl chloride (PVC) and ethylene-vinyl acetate (EVA).